Yet another Parisian watchmaker (after Ernest-Narcisse Lobbé) invented an early keyboard adder in 1850s—Eugène Jacot des Combes was a holder of two french patents for adding machines (machine à additionner) (Brevet №43781 from 1 February 1860, and Brevet №68027 from 11 July 1865). des Combes has also another patent from 1871 for apparatus for electrification of the air and the ozone production. The adding machine of Jacot des Combes is an one-column keyboard adder with a 3-positional result mechanism. It was one of the early keyboard adders, after the machines of White, Torchi, Schwilgué, Parmelee, the abovementioned Lobbé, Castle, Hill and Nutz. 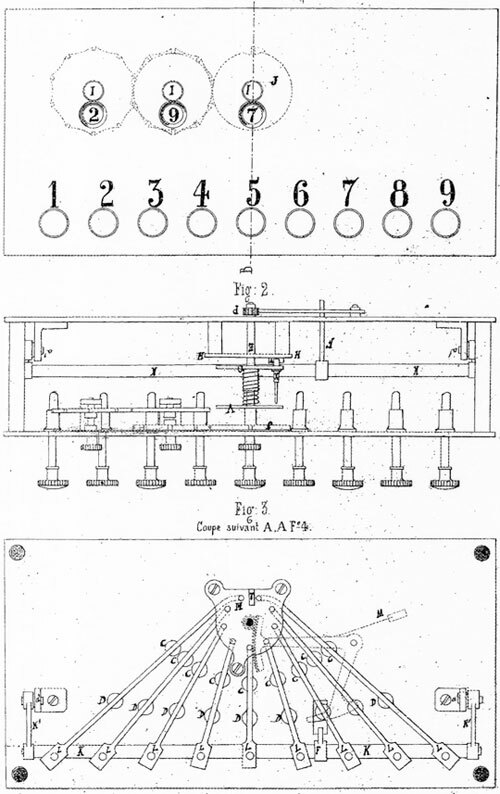 The construction of the device (see the patent drawing below) seems to be simple and reliable, but nothing survived to our time about Eugène Jacot des Combes and his machines.